Diocese of Parramatta pilgrims at the Basilica and Shrine of Our Lady of Guadalupe. Image: Diocese of Parramatta. 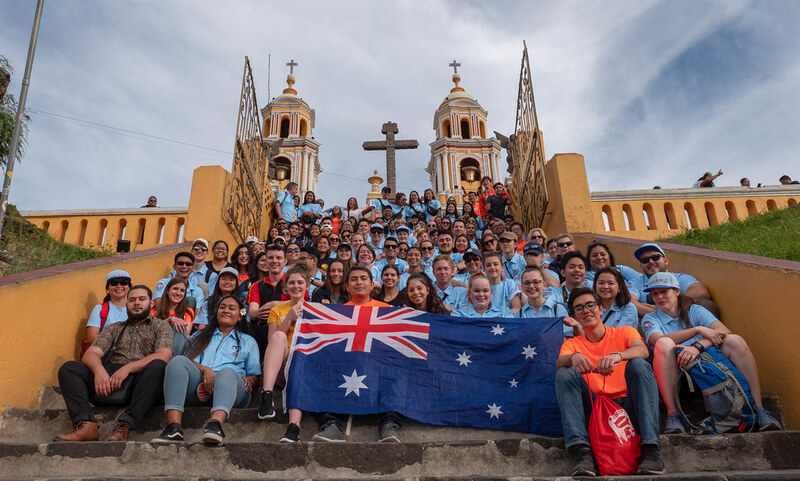 The Mexican leg of the Diocese of Parramatta World Youth Day 2019 pilgrimage reached its climax on Saturday with a visit to the Basilica and Shrine of Our Lady of Guadalupe. The pilgrims also attended Mass at the old basilica. The day began with pilgrims walking four kilometres to the basilica. The walk reflects the Mexican tradition of going on pilgrimage from their home town to the basilica, located in Mexico City. The basilica, one of the world’s most revered shrines, is the most visited Christian pilgrimage site in the world. The basilica contains the tilma with an image of the Virgin Mary who appeared to St Juan Diego in 1531. Diocese of Parramatta pilgrims bring roses to the basilica. Image: Diocese of Parramatta. The pilgrims brought roses to the basilica for the Virgin Mary. This is a local tradition dating back to St Juan Diego who was instructed by the Virgin Mary to bring her flowers. The Diocese of Parramatta pilgrims joined thousands of other worshippers who made a pilgrimage to the shrine. Groups of pilgrims were given personal tours of the site by local school students. The Diocese of Parramatta pilgrims also joined pilgrims from the Archdiocese of Melbourne and Sydney Catholic Students for a Mass celebrated in the old basilica by Melbourne Archbishop Peter A. Comensoli and concelebrated by Bishop Vincent Long OFM Conv and other priests from the pilgrimage groups. The tilma with an image of Our Lady of Guadalupe. Image: Diocese of Parramatta. In his homily, Bishop Vincent said that we are called to be like Our Lady of Guadalupe, a visible presence of God’s love in the world. The pilgrims were then given the opportunity to spend time exploring local markets and a visit to a local school, where they were able to reflect on their Mexican journey. Pilgrims departed Mexico for Panama on Sunday (via the United States) for the beginning World Youth Day 2019 in Panama starting on Tuesday.